The whole <Prism> mechanic is a strange one. On the one hand, it offers the promise of an extremely powerful card with some minor drawbacks mechanically, such as only being able to have one copy and having it get removed from play after it’s used or KO’d in the case of a Pokemon. On the other hand, a lot of the <Prism> cards – while certainly stronger than your average non-EX/GX – are somewhat…underwhelming, in my opinion. And Giratina <Prism> is the one I recall first seeing that I felt like this was going to be the case. Giratina <Prism> is a Basic Psychic Pokemon, 160 HP, with a Dark Weakness, a Fighting Resistance, and a Retreat Cost of 2. His Ability, Chaotic Star, lets you attach 2 Psychic Energy from your hand onto him when he gets played onto the Bench, while his attack Crisis Dive is a 4-for-160 that needs you to discard 2 Energy from him as part of the cost of the attack. Never mind that all 4 Energy need to be Psychic. Giratina <Prism> does have potential as a surprise attacker, and dealing 160 is just a boost away from OHKO-ing most Basic Pokemon-EX/GX, but at the same time…the investment though. You have to be able to have at least 2 Psychic Energy in hand to make his coming into play more worthwhile, and on top of that, he has to discard 2 Energy for his attack – which costs 4 Energy in total, meaning not only do you have to wait at least a turn to attach enough Energy to attack, but without a card to reattach Energy in some manner, he can’t even attack on subsequent turns. That really hurts his power level, and he’s a card you can only run one-of. To be a good <Prism> card, you don’t just need a powerful effect or attack – you need to justify yourself as a one-of in the deck you’d be running in. Sure, you could combo this with Lunala <Prism>, but then you’re relying on two one-of cards in your deck to be in play at the same time to make it all work! And beyond that, it’s just not worth it to make Giratina <Prism> a main offensive attacker. Again, he might work as an alternative, but even then he’ll need at least one turn after he comes into play to be worthwhile. Personally, that’s enough for me to give him a pass. Arora Notealus: <Prism> cards can be powerful, but they’re a lot like ACE SPEC cards – the power of the effect needs to justify running the card even at one. There were some ACE SPEC cards that similarly fell short for one reason or another, and I’m sure as more cards are revealed and released that there will be <Prism> cards that are better or worse. The good news is that at least you can run multiple <Prism> cards in a deck, even if you can’t run multiples of those cards – a key difference between them and ACE SPEC cards! Side Review: Fire/Electric Memory – …I mean, what can be said about these? They’re Memories for good Type coverage in Silvally-GX decks…that’s it. Next Time: I’m surprised we hadn’t actually reviewed this guy by now…even though we’ve kinda reviewed him a few times already? 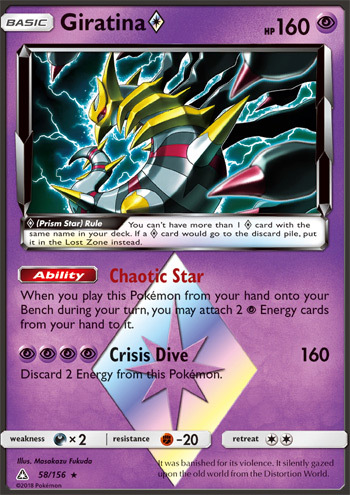 We got one more Prism Star card left to review in the Sun & Moon Ultra Prism set, and that’s Giratina Prism Star. Being limited to one card instead of four hurts, since such cards may be prized, and the prism star rules means you only have one shot, cause it gets banished once it is discarded. Pretty fitting for Giratina, cause it got banished due to its violence, and it silently moves around in the Distortion World. As a Basic Psychic type with 160 HP, weak to Dark, resists Fighting, and a retreat cost of two, you can expect this card to contribute longer. Chaotic Star states that whenever you put this Pokémon from your hand into your bench, you get to attach two Psychic energies from your hand to this Pokémon. This could be a good follow-up to it’s only attack, Crisis Dive, which costs PPPP for 160 damage, and you discard two energy from this Pokémon. Makes it a bit hard to constantly stream the same attack over and over again. Still, backed with Choice Band, you are hitting for 190, which is a OHKO on most Basic-EX/GX Pokemon, so it might be very well worth such an investment. Or you would like to attach Fighting Fury Belt for extra survivability, as a 200 HP that’s worth a single prize can frustrate your opponent. There are a couple ways to use Giratina Prism Star. You can pair it with Malamar from Japanese’s SM6 expansion (which, eventually, may make their way to Forbidden Light) because it’s ability works like Dynamotor/Metal Links but for Psychic energy. However, being limited to one Giratina Prism Star means you will need Dawn Wings Necrozma-GX to use Invasion to get Giratina on the Bench followed by however many abilities you used from Malamar. And then you bring Giratina back in front after Dawn Wing Necrozma-GX retreats. A clunkier build would be using Gardevoir from BW Next Destines, whose ability makes Basic Psychic Energies become double Psychic energies! Giratina can attack with just two Psychic energies while discarding just one basic Psychic energy due to each Basic Psychic Energies being worth PP when Gardevoir is in play. Right now, Lucario GX and Buzzwole GX are still dominating, and Giratina Prism Star can OHKO them due to weakness. However, I am not so sure if Giratina can do the job well. Regardless, it’s an nice option to have! Giratina (UP 58) gets its first Sun & Moon era card in the form of a Prism Star out of the Ultra Prism expansion set. Similar to the other Prism Star Basics, it has a tanky 160 HP, which is about the most HP you’ll find on a single prize Basic Pokemon. It does have an ability, Chaotic Star, that allows you to attach two Psychic energy cards from your hand to Giratina, but that is only if you play it from your hand, so you can’t use Brigette to get it out. Still, being able to put three Psychic energy down in a single turn (two from Chaotic Star plus one from your regular attachment) would be good… if you didn’t have to have them all in hand and Giratina’s only attack Crisis Dive didn’t cost four Psychic energy. There is the much heralded Malamar coming in Forbidden Light that would help Giratina and actually potentially make it possible to attack with Tina in the same turn you play it down, but the parameters around this Pokemon pretty much limit its usefulness. You have to have two Psychic energy in hand when you play Lunala down – it would have been much better had it allowed you to search your deck or discard. It would also have been better if you could have attached the two energy regardless of when you put it in play, not just from your hand. I do think that Giratina Prism would complement Lunala Prism in that it would help boost Lunala’s damage, and you could even potentially play Giratina down and then Ninja Boy into Lunala to help accelerate Lunala to its attack. But overall I just don’t think Giratina is that great of a card – maybe that will change in the future, and maybe I’m underestimating it. Certainly 160 damage (190 with a Choice Band) shouldn’t be taken lightly, and like I said, Malamar could help make this more viable. Right now, though, I think there are better Pokemon out there than Giratina. So I wouldn’t completely right off Giratina just yet – it may well have more future value than current. And it’s not expensive and not hard to get, it might make for a decent inclusion in a future Psychic toolbox deck.